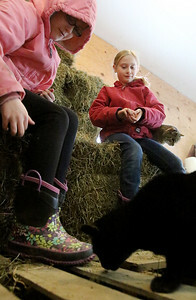 Matthew Apgar - mapgar@shawmedia.com Leyna Weber, 8, left, and her sister Morgan, 7, sit on bales of hay inside their family's barn as they feed cat treats to their barn cats on Friday, Jan. 22, 2016 in Woodstock. The McHenry County Animal Control is creating a network of animal shelters to reduce the number of animals, mainly cats, being euthanized. 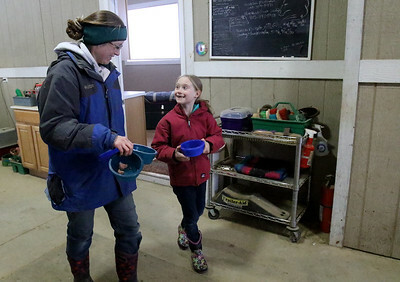 Matthew Apgar - mapgar@shawmedia.com Julie Weber, right, and her daughter Morgan, 7, feed their four barn cats on Friday, Jan. 22, 2016 in Woodstock. The McHenry County Animal Control is creating a network of animal shelters to reduce the number of animals, mainly cats, being euthanized. 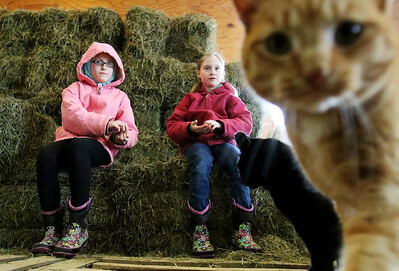 Matthew Apgar - mapgar@shawmedia.com Julie Weber and daughters Leyna, 8, back, and Morgan, 7, front, feed their four barn cats on Friday, Jan. 22, 2016 in Woodstock. The McHenry County Animal Control is creating a network of animal shelters to reduce the number of animals, mainly cats, being euthanized. 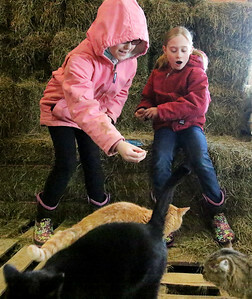 Matthew Apgar - mapgar@shawmedia.com Leyna Weber, 8, left, and sister Morgan, 7, feed their four barn cats treats on Friday, Jan. 22, 2016 in Woodstock. The McHenry County Animal Control is creating a network of animal shelters to reduce the number of animals, mainly cats, being euthanized. Matthew Apgar - mapgar@shawmedia.com Julie Weber and daughter Morgan, 7, carry cat food to feed to their four barn cats on Friday, Jan. 22, 2016 in Woodstock. The McHenry County Animal Control is creating a network of animal shelters to reduce the number of animals, mainly cats, being euthanized. 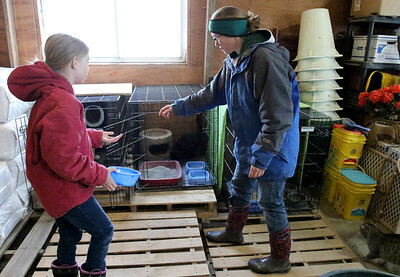 Matthew Apgar - mapgar@shawmedia.com Leyna Weber, 8, left, and Morgan, 7, feed their four barn cats on Friday, Jan. 22, 2016 in Woodstock. The McHenry County Animal Control is creating a network of animal shelters to reduce the number of animals, mainly cats, being euthanized. 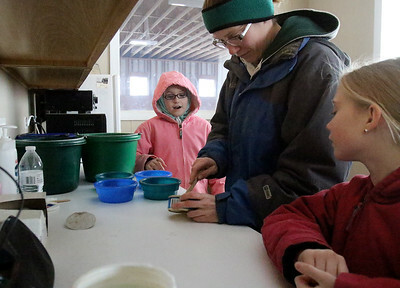 Julie Weber and daughters Leyna, 8, back, and Morgan, 7, front, feed their four barn cats on Friday, Jan. 22, 2016 in Woodstock. The McHenry County Animal Control is creating a network of animal shelters to reduce the number of animals, mainly cats, being euthanized.